Can Batman save the day? It’s the Batman superheroes and villains in the Batman Finger Family Song! There’s Batman and Robin of course, plus lots of villains like Joker, Riddler, and Catwoman. Let’s meet all the Batman superheroes with the Finger Family Song! 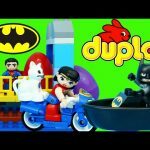 Superheroes Finger Family Song – Superman, Batman, Spiderman, Hulk & more!